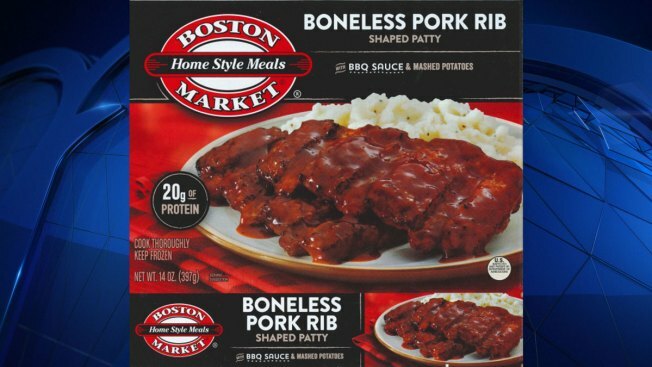 Boston Market pork rib frozen meals have been recalled after extraneous material was found inside the meat, Sunday, February 24, 2019. Boston Market pork rib frozen meals have been recalled after extraneous material was found inside the meat. Bellisio Foods, based in Jackson, Ohio, recalled more than 173,000 pounds of the "Boston Market Home Style Meals boneless pork rib shaped patty with BBQ sauce and mashed potatoes" after consumers complained of finding glass or hard plastic in the rib shaped patty. There have been no confirmed reports of injuries due to consumption of these products.